It’s been five months since the tragic and preventable Marjory Stoneman Douglas High School shooting in Parkland, Florida, and because very few changes have been made to keep kids safe, parents have taken up political arms to make necessary changes in the system that failed the country. Andrew Pollack, the father of Meadow Pollack who died during the shooting, has been the most vocal parent against the “liberal agenda” of Broward County School Board, its Superintendent Robert Runcie, and the failed Promise program that was put in place to supposedly protect children. During a meeting of the Coral Springs/ Parkland Republican club in Coral Springs, Florida, Pollack, who addressed the group, did not hold back his frustration and understandable disdain for the school board and the Promise program. “When he said those words, “while in high school,” I knew this guy was lying to everyone throughout the county. This piece of sh*t was in the promise program while in middle school. “I couldn’t understand it why we had a school board of nine people. Not one person stepped up for what happened and wanted to accept responsibility. Not one of them, not even the superintendent said we should reevaluate this program and see where there is a problem with it, and we should fix it. Not one of them. To this day, there is not one board member in Broward County or the superintendent, that thinks this is a problem. He didn’t stop there. Pollack continued challenging the “mentally challenged” school board over their support of the program, saying that teachers don’t support it. “I’ve never been into politics, but they put their political agenda in front of our children and our teachers. These mentally challenged people think that they are just going to vote Democratic –their going to vote blue, they don’t care that the teachers don’t have any Workman’s Compensation, they had to go back to school ten days after walking over dead bodies in that building. Those teachers had to go back to school. No disability insurance for these teachers, back to school they couldn’t afford to stay home. None of them want this Promise program, they have a weak union. I’m from New York, I’m use to strong unions. “We are not politically correct. We are going to do what’s right. Every other candidate is worried about their political correctness and not calling out this Promise program, which what it is, it’s a bunch of bullsh*t, this Promise program,” said Pollack. It means so much to this county if we can flip this frick’n school board. They are mentally challenged. They’re not putting our kids first. They need to be worrying about who I am. 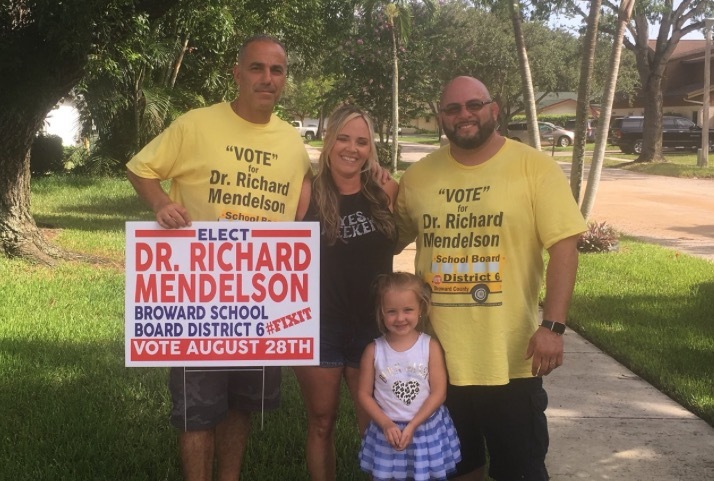 Mendelson and the other Broward County School Board candidates will be on ballot in the August 28 primary election.